A short YouTube version is available here. [Expand to the full article to be able to click on the link]. In the last 41 lessons we were looking at the grammar and usage of Classical Sanskrit. In this and the next few lessons, we will look at Vedic Sanskrit. The term Vedic Sanskrit refers to the metrical language of the Vedic hymns and the prose of the Brāhmaṇas and the Brāhmaṇa-like portions of the various recensions of the Yajurveda and the Atharvaveda. You can clearly see the language usage changing as you go from the Rigveda to the Brāhmaṇas. I will mainly use the Rigveda (and sometimes the Taittirīya Saṃhitā and others), to illustrate the points made in the lessons. The transition of the Sanskrit language: The Rigveda represents the oldest stage of the language, the next stages are represented chronologically by the following: the various Saṃhitās of the other vedas, then the Brāhmaṇas, then the Āraṇyakas and the Upaniṣads, and then the Sūtras (which is almost Classical Sanskrit). Classical Sanskrit proper begins with the Code of Manu, then the epics, the law books, the Purāṇas and then the other great works of literature (poetry, drama etc.) and other many technical works. There has been considerable debate as to when and where Sanskrit evolved, and when and where the earliest Vedic hymns were composed. I do not wish to wade into the eddies of these turbulent waters. But, I believe that the earliest hymns of the Rigveda were composed around 5000 to 6000 years ago. Of course, we need to remember that most of the Vedic language productions were composed before writing was introduced to the ancient users of the language. These early productions were handed down the generations through an oral tradition, making these the oldest unbroken tradition in existence. These hymns have been handed down the generations without a single mistake creeping in through the various passages between ear and mouth. This is due to the extraordinary lengths that the ancient poets and their culture in general went through to preserve the fidelity of the texts. 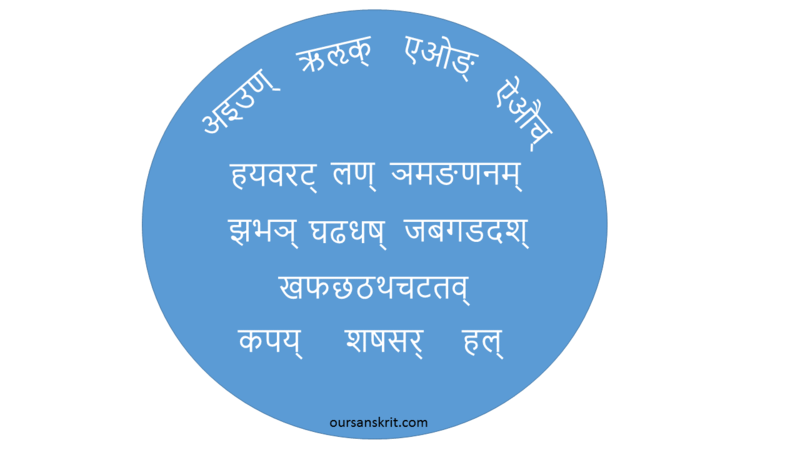 The text is rendered in many forms of recitation or Pāṭhas. These different forms of recitation permute and repeat the words of a text in various ways. So a words and its accent in a text is recited within various combinations with and without applying the rules of Sandhi. These extraordinary techniques guaranteed the most perfect tradition in terms of sound and unaltered word order. The most used of these various Pāṭhas is the Pada-Pāṭha which is a recitation with a pause after every word. This method suppresses Sandhis and restores each word in its original intended form. So, we can be sure that any word and its sound that we see in the Rig and other vedas are accurate as the poets intended when they made it. and the use of periphrastic verbal forms. Vedic Sanskrit differed from classical Sanskrit in that there was more use of the middle voice, fuller use of the tenses, moods, infinitives, inflected participles and genuine prepositions. However, the difference between Vedic Sanskrit and Classical Sanskrit is not as great as between Old English and Modern English. There is nothing in Vedic Sanskrit that is unintelligible to a person who has learned Classical Sanskrit. In another article, The case for learning Sanskrit, I had given a brief description of the key differences between Vedic and Classical Sanskrit. The difference between Vedic Sanskrit and Classical Sanskrit is not as great as between Old English and Modern English. There is nothing in Vedic Sanskrit that is unintelligible to a person who has learned Classical Sanskrit. The key changes from Vedic to Classical are the loss of the pitch accent (this is a big loss; the accent had very significant grammatical and semantic functions); the loss of the subjunctive mood (again a big loss; the kind of nuances of meaning that the subjunctive could express was lost); the loss of various kinds of infinitives; the loss of certain sounds and the change in articulation of certain sounds; and some changes to declensional and conjugational endings and formations. Of course, there is a difference in the style of writing. The loss of the accent. In Vedic, the preposition (upasarga) and the corresponding verb can be separated whereas in Classical Sanskrit they are always together. The loss of the subjunctive mode. I have replaced the subjunctive with the present (I could have used the future or the optative). In Vedic, the verb kr̥ कृ was of Class 5 (svādi) but Classical Sanskrit it seems to have moved to Class 8 (tanādi). Also, I have replaced the subjunctive by the present. In Vedic, the nominative plural neuter ending for “a” nouns could be ā or āni, आ or आनि. In Classical it is always āni आनि. The stress particle gha घ or ghā घा is not now commonly used. As you can see the differences are not such that it becomes mutually unintelligible. You can see the continuity clearly from the example. To start off on Vedic Sanskrit, it will be good if you looked at Vedic hymn that I have translated and interpreted. Please see A Historical event in the Rig Veda – The Vr̥ṣā́kapi Hymn (RV 10.86) See also a piece of another hymn here. For you to get an initial familiarity with Vedic Sanskrit, I give here RV (Rigveda) 1.1.9 (the ninth verse of the 1st hymn of the 1st Mandala). This is a hymn to Agni in the Gāyatrī metre. Please go through this and familiarize yourselves with this. This is the end of lesson 42. This lesson was an introduction to Vedic Sanskrit.